In this section, we will focus on describing our research stance, the ethics of working in public spaces, and how working with students enriches academic experiences and scholarly research. 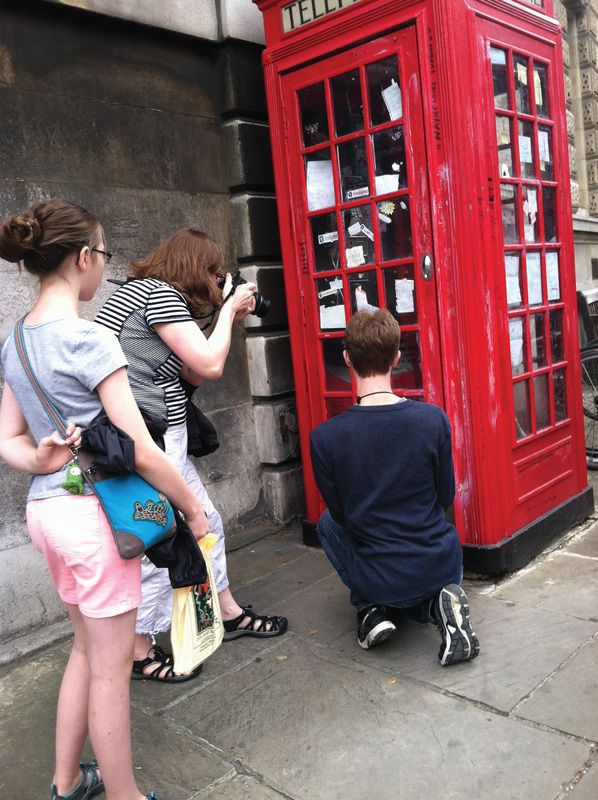 We explore our stance as fan scholars and scholar fans who research visitor experiences at spaces of memory. We carried this stance with us throughout this project, affecting how we see ourselves, see our audience, prepare for our research work, conduct our research, and analyze what we find in these spaces, and what we synthesize into this digital book. Fan Scholar. Scholar fan. We as the authors of this digital book shift between and across these titles depending on our levels of expertise, how we are witnessing and participating in this work, and the kind of analysis we are doing. In other words, we see ourselves as working together in this research project, united by fandom and scholarly research. That said, much has been said about this distinction between fan scholar and scholar fan, in addition to the arguments over whether or not one must engage with a fan community to be considered a ‘fan’ (Bird, 2003; Sandvoss, 2005). These terms have much to do with issues of hierarchy, class, and power. Are you scholarly enough to produce quality research and scholarship? Are you fan enough to understand these communities? As Jonathan Gray (2011) posits in his critique of these two terms, we wonder if “one side [is] an apology for the other, as in, 'no, no, don’t worry, I’m not a fan, I’m an aca-fan’” (n.p.). We share Gray's understanding of the need for critical distance and analysis, though we also agree with Matt Hills (2011) that “proper distance” is an ideal rather than a concrete notion. We also agree with Gray's views that the term aca-fan itself is unclear and potentially exclusive in certain ways both within academia and within fandom. Karen Hellekson (2011) states, “Aca has a snooty connotation: I have been trained to interpret, and I know better than you. Fans are immediately suspicious” (n.p.). Her concern is clearly that the higher cultural value of the academic will cause fans to resent and resist the academic's cultural power and position. We understand too Louisa Stein's (2011) concern that we should not simply abandon the term, however, as it can be useful in explaining to others in the fan community what it is we are doing (i.e., it shows that we are part of the in-group, just a specialized part of it). Because of these issues, we take a stance that creating these distinctions were not useful to our work, and we seek to promote scholarship that seeks to value the work of fan scholars and scholar fans. For this project, we took the stance that we—fans, scholars, students, researchers—are better together. To go a step further, it would be limiting, if not disingenuous, to build this project from only the perspective of a (possibly distant and detached) academic. This work—preparatory readings, research, site visits, analysis, synthesis, and writing—is done by and with fans across the spectrum of fandoms. In our case, the authors listed on this digital book project represent scholar fans and fan scholars, meaning, some of us are trained researchers (i.e., PhDs) and others of us are fans who have spent a considerable amount of time studying, understanding, and engaging with our fandom. Neither group is better than the other; both have strengths and weaknesses as researchers and fans. We too are fans. And we too need that emotional investment in order to dig deeper and reflect more genuinely. This experience forced us to look at each space in two different ways—as researchers and as fans. We were mindful of others experiences as we became careful observers in each space, and focused on not just our experiences as fans or researchers. From time to time, this meant we had to take off our fan goggles and try to experience these spaces without our own filter. At the same time, we knew it was important not to remove ourselves completely. We decided to visit spaces multiple times in an effort to not restrict the space to one memory or experience. With that in mind, we realize (and hope) that you will approach this digital book project from different perspectives. Perhaps you are an academic interested in participatory spaces, experience architecture, writing practices, and/or visual rhetoric. You may be a fan of Harry Potter, Doctor Who, Torchwood, or Princess Diana. You might even be someone who enjoys one of these fandoms so much that you write your own fan fiction, celebrate the birthdays of these characters, and cherish your time in these worlds. You may also be someone who is simply curious about what goes on in these spaces that you have yet to (or cannot) visit. All of you are welcome, and we hope this work will help you enjoy your fandom and continue your work—whatever that work may be about. To do this kind of work—fan ethnographies in public spaces—you must be very aware of your participants, the content producers, the governments, the space owners, your surroundings, and yourself. We consider each of these spaces to be cult geography, or a “sacred place which can serve to anchor and legitimate the cult fan’s attachments” (Hills, 2002, p. 144). Liza’s understanding of tensions within these spaces was based on the work of Michel de Certeau (1984). De Certeau’s scholarship on strategies and tactics formed much of the early thinking in this book. In particular, we analyze the ways in which fans write and make in these spaces, noting the moves that corporations, cities, and space owners make in reaction to fan texts. In the case studies, we discuss these relationships and tensions. For this project, de Certeau’s work helped us form a research stance that emphasized the experiences of everyday people. Further discussions of individual spaces and the work completed there are provided in each case study. It was important for us as researchers and members of these fan communities to ensure the privacy of the visitors and the sanctity of these spaces. In their edited collection Internet Inquiry (2009), Annette Markham and Nancy Baym create a foundation for ethical, informed, and sensitive research methods. While the subject matter is internet studies, this collection grapples with topics of interest to any scholar studying sensitive communities. Discussing issues of interpretation, privacy, and quality, Markham and Baym have created a useful and accessible collection that engages scholars in timely conversations about our work. While we were in these spaces, we did our best to be as respectful as possible. We avoided making loud noises, laughing, running around, or any other behavior that would be seen as disrespectful. We tried to move between and around participants in a manner that was not disruptive. That way, the visitors could enjoy the space while we conducted our research. If we were to take photos of people, we worked to avoid photographing their faces. You will notice in this book that we did our best to respect the people who visited these spaces. When we did show images of people's faces, we did so with their permission and secured photo release forms. On many occasions in these spaces, we encountered people dedicating items. Sometimes, we would identify ourselves as researchers studying the memorial and ask if it was all right to talk to them. We would ask if they would be willing to answer a few questions about the space or the object, such as why that particular item and why they wanted to dedicate it. If it felt appropriate and necessary, we would ask to photograph them participating (generally using their hands for scale and avoiding their faces). For the most part, people were happy to engage with us for a few minutes and were frequently interested in our work. When working on almost any archaeological site (a relevant comparison for Melissa Beattie’s work), it is normal to have occasional encounters with tourists and locals. These tend to be low intensity, frequently with little or no interaction (“Have you found any [gold/dinosaur bones/bits of the true cross] yet?” “No.”) and of generally short duration. Working at a participatory memory site was a very different experience. Many of these spaces were in highly trafficked areas surrounded by busy streets, restaurants, hospitals, and museums (and in the case of Ianto’s Shrine, near the seat of Welsh government). As we were there recording the space with a notebook and camera, those who were not aware of the memorial’s purpose often seemed to view us as an authority, something that would increase if and when we identified ourselves and our project. There were, however, two distinct downsides to being on display in such a way. The first was methodological, the second more personal. First, it was possible that our presence at the space impacted the dedications and/or responses of dedicants. Unfortunately, there was no way around that. We did try to compensate for it by being as neutral and open as possible, but there was no way to be certain what effect our observation had. The second problem involved the negative comments that were sometimes overheard at the memorial. These included homophobic remarks at the Ianto Shrine as well as the belittling, often strongly gendered, comments calling fans "crazy" or stereotyping them as teenage girls. Being immersed in that negativity, on the rare instances it would happen, can be demoralizing to a researcher. That said, the richness of the materials and writings left behind by the participants was a continuing source of inspiration and, often, evidence of the positive impact of participatory memory. All of us have associated with one or more online communities while studying the spaces in this digital book project. We relied on these spaces to get a sense of the area, learned about what other fans were talking about, and learned about new developments. We found that reaching out to locals in the area kept us apprised of any new activity. 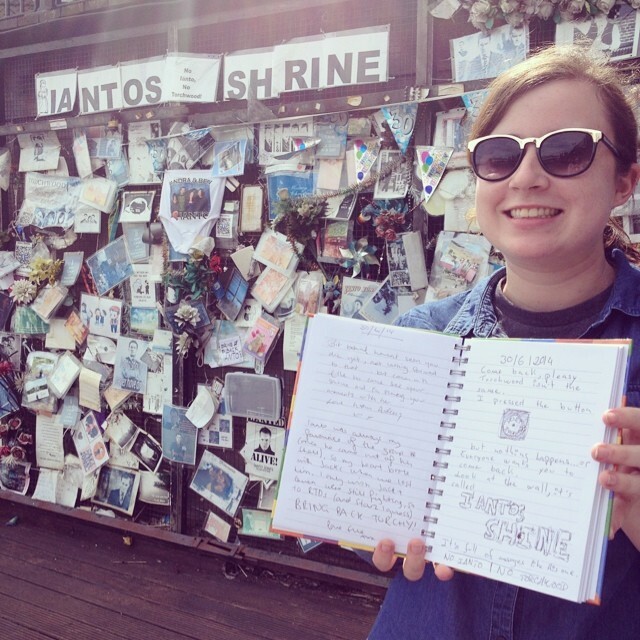 During our research work, Melissa created a LiveJournal community and informed everyone what she was doing at the Ianto memorial and why, while Liza used the hashtag #participatorymemory to talk about this work. Speaking specifically to our academic audience, we hope that you will find the discussions and cases in this book valuable for another reason. Namely, we want to encourage you to work on research projects with undergraduates. In our case, we are at a university that has one of the largest study abroad programs in the country. We have a wealth of material to draw on and a strong support staff, giving us the opportunity to explore different kinds of programs. 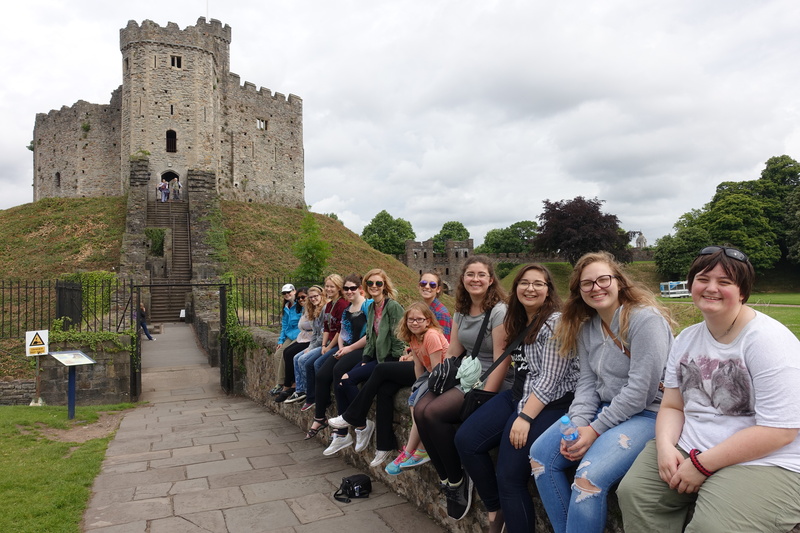 Our students are enriched by study abroad travel, and we already have a body of research to support this idea. This research includes well-cited work by Philip Anderson, et al. (2005) on cultural sensitivity, Michael Dwyer’s (2004) research into program length, and Tracy Williams’ (2005) work on intercultural communication. Focusing on travel abroad, the “Overseas Study at Indiana University Bloomington” guide from 2009 contains sections on participation, student gains, and academic outcomes. Brian Ballentine’s (2015) work points to the need for biculturalism—a deliberate attempt to identify with the home and host cultures—as “the desired acculturation strategy, and integrative complexity and its associated creativity are among the desired learning outcomes” (p. 295). Our students need to embrace multiculturalism—the culture of their home country, the country they are visiting, and the fandoms they need to be familiar with to participate in these spaces. While many of the students were familiar with at least one of the fandoms we explored, many of them were either new to these spaces or did not have knowledge about each fandom we included. We argue strongly that scholarly research can be enriched by interacting with student researchers. They are new to ideas, curious about spaces, and interested in digging into projects. They will help you rethink your own ideas, pushing you to explain yourself and show them evidence. This digital book project was mightily enriched by these interactions with students, so much so that Liza decided to coauthor this book with her students and junior colleague. At the beginning of this project, I was very unfamiliar with Princess Diana, her life story, and her fandom. Despite this lack of memory, I was intrigued by the legend-like quality of Princess Di—the very mention of her name seems to invoke a strong reaction in people (whether sadness, sentimentality, or disapproval). 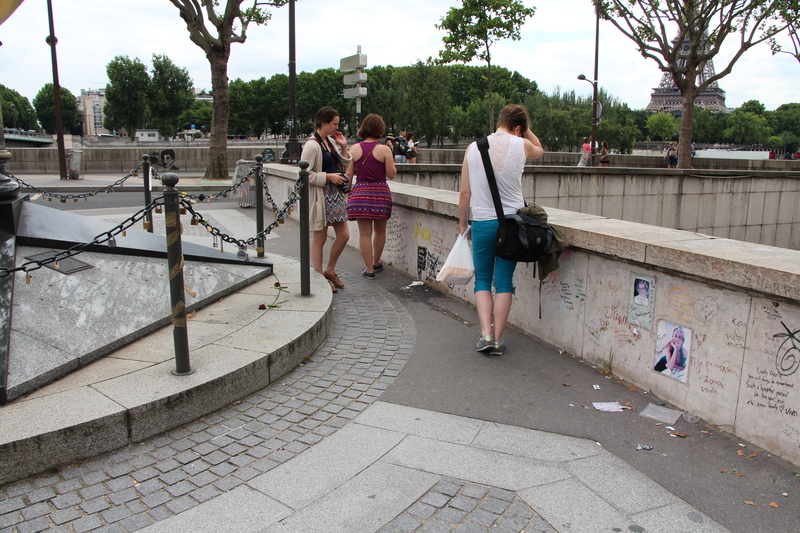 When I came to the Paris memorial, my participation in this space was as an observer and researcher. 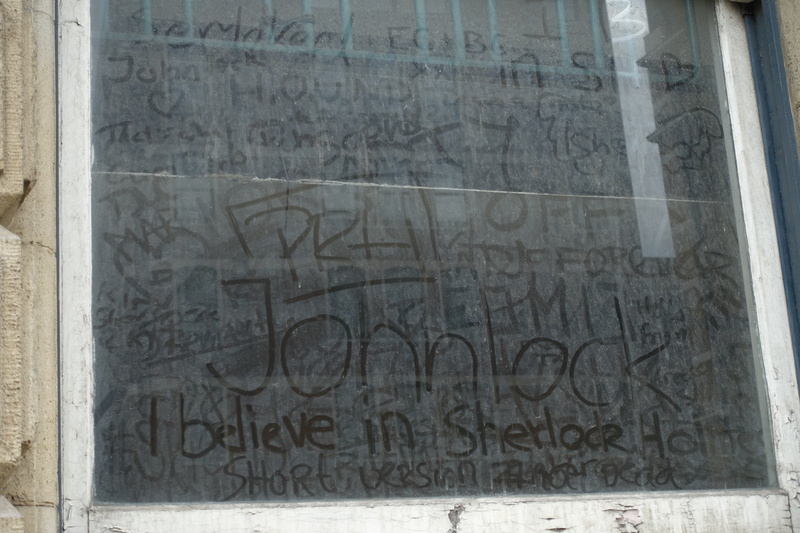 I completed the pilgrimage only to take photos and document the written and visual content left on the bridge wall. I did not feel “worthy” enough to participate in this space. I had just started learning about the Princess Diana fandom and did not yet feel an emotional connection to her memory—I identified more as an observer. Instead, I respected Diana’s fans for their dedication and didn’t want to devalue their display of devotion.